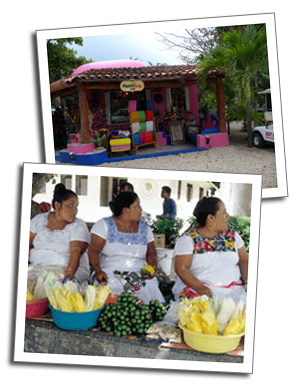 Akumal is located on the Yucatan Peninsula, along the Caribbean coastline. Located approximately 60 Km south of Cancun, this coastal village feels like paradise with its white sandy beaches, turqoise waters, palm trees, surf, & sand. 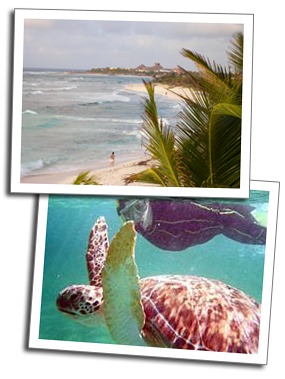 Also known as the "Place of Turtles", Akumal Mexico boasts several restaurants, souvenir shops, dive shops, and beach bars. With their white sands and turquoise carribbean waters, the 3 bays of Akumal (Aventuras Akumal bay, Greater Akumal Bay, and Half Moon Bay), provide excellent snorkeling and wildlife viewing. Aventuras Akumal is the home to the second largest Turtle laying population on the Yucatan Peninsula, with the endangered Green and Loggerhead turtles annually returning to dig their nests and lay their yield of protected turtle eggs.